curriculum and initiating their activities. We strive to fulfill the needs of the five major developmental areas through the infant’s everyday routines and experiences. 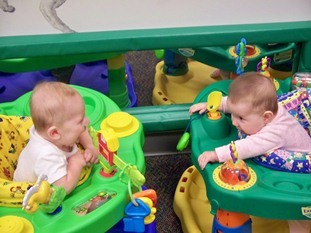 These experiences should enhance the infants, physical, emotional, social, cognitive and perceptual skill development. Character First – Twelve character qualities are introduced to the children throughout the course of the year. Each quality is combined with an animal and is enhanced with stories, songs and reminders throughout each day to lay the foundation of good character development. Language and Literacy – Through storytelling, finger plays, sign language, songs and infant/teacher interactions, children will begin to develop their language skills through repetition and conversation. These are crucial tools to give children the opportunity to express themselves. Music (special) – In addition to the daily musical activities the teachers do in the classroom, a music teacher comes into the room once a week and works on musical concepts with the kids at their level. She sits with them on her lap and allows them to explore musical instruments such as bells and shakers; musical tones and the introduction of simple instruments bring a smile to every child as they create their own music.